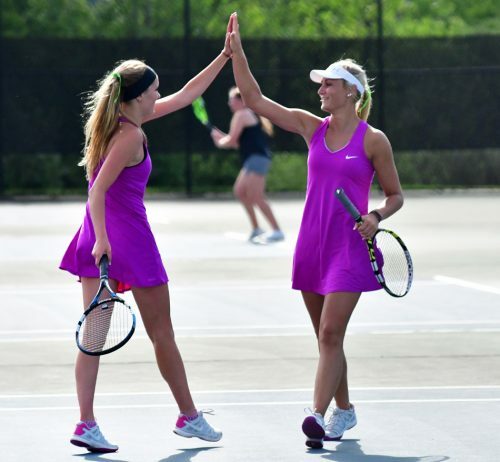 MIDDLEBURY – The Concord girls tennis team achieved a rare feat Wednesday night. They did it in dominating fashion to boot. 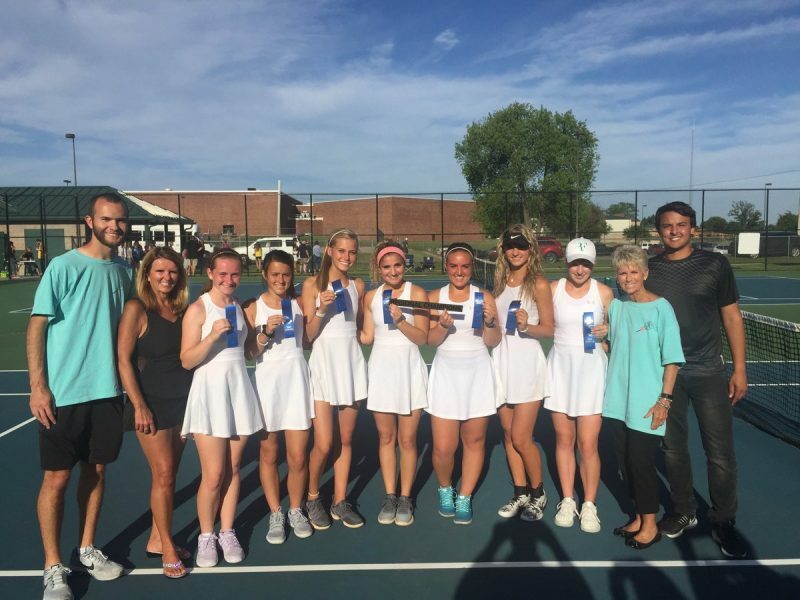 Coach Jan Soward’s squad not only claimed its second straight regional championship by downing fellow Northern Lakes Conference member NorthWood 5-0 in the finale of the Northridge Regional. The Concord ladies also made it a clean sweep of NLC, sectional and regional titles for the first time in program history since way back in 1992. Concord, now 14-3, advances to play No. 12 ranked Delta (17-3) on Saturday in the Homestead Semistate at 10 a.m. Delta blanked Lapel 5-0 Wednesday evening to win the Marion Regional crown. NorthWood, which lost 5-0 to Concord in the regional semifinal a year ago, closes out its season at 12-7. “Our girls deserve all the credit,” said Soward, now in her 11th season. “They came out intense, ready to go and got right after it. They put the pressure on from the start. I’m really proud of them. I just tried to relax them tonight and make them laugh. They went out and played their game. Concord, which beat Central Noble 3-2 in semifinal play Tuesday night, was in charge from the get go on all five courts versus the Panthers. The Minutemen had beaten NorthWood 4-1 back on April 13 in the NLC opener. Concord went on to finish 6-1 in league play before winning the NLC Tournament to claim the overall league championship. Concord took a 1-0 lead as junior Kelsee O’Dell and sophomore Lauren Pollock rolled to a 6-0, 6-1 win over junior Riley Graber and sophomore Lauren Mikel at No. 2 doubles. The Minutemen made it 2-0 as its No. 1 doubles duo of junior Keegan Thursby and sophomore Meaghan Godzisz beat seniors Kennedy Wiens and Betsy Nunemaker 6-3, 6-2. Concord clinched the title when senior Camille Lozier exited the No. 3 singles court with a 6-0, 6-2 win over junior Gretchen Adams. The champions completed the shutout as senior Maya Klopfenstein topped sophomore Alex Jesse 7-5, 6-3 at No. 1 singles and junior Regan Landis defeated junior Reegan Miller 6-2, 6-1 at No. 2 singles play. The NorthWood lineup had changed since the first meeting with Concord as Jesse was out then due to a leg injury. In that match, Concord won at all three singles positions and at No. 1 doubles. Miller played No. 1 for the Panthers then with Adams at No. 2 and Mikel at No. 3. The NorthWood No. 1 doubles lineup was the same with Graber and Olivia Feller at No. 2 doubles. Concord had the same exact lineup some six weeks ago against the Panthers that took the court Wednesday night. NorthWood just could not get any momentum going from the start. “We just did not have a lot of good energy coming in or in warmups tonight,” said NorthWood coach Tif Schwartz, whose team beat Fremont 4-1 in a semifinal match Tuesday evening. “We were just very lethargic. We got off to very slow starts. NorthWood loses two seniors in Wiens and Nunemaker. Fairfield standout Morgan Mast extended her individual season at No. 1 singles play Wednesday night at Northridge. The Falcon star, who will play at Grace College, defeated Reagan Smith of Lakewood Park 6-0, 6-0 in the individual sectional tournament for No. 1 players who are undefeated in the state tournament series. Mast will play Jadyn Davis of Angola Thursday night at 5 p.m. back at Northridge in the sectional singles title match. Davis beat Bethany Lancaster of DeKalb 6-1, 6-3 Wednesday. The Elkhart Central No. 1 doubles team of Hanna Losee and Gabby Carr will also keep playing. The pair beat the West Noble team of Tara Milelr and Riley Kruger 6-4, 6-2 Wednesday night.